The University of Tampa Spartans are the NCAA Division II national champions. On Dec. 1 in the A.J. Palumbo Center in Pittsburgh, PA, the No. 1 seeded Spartans defeated the No. 3 seed, Western Washington University Vikings, in a five-set thriller to win the title. 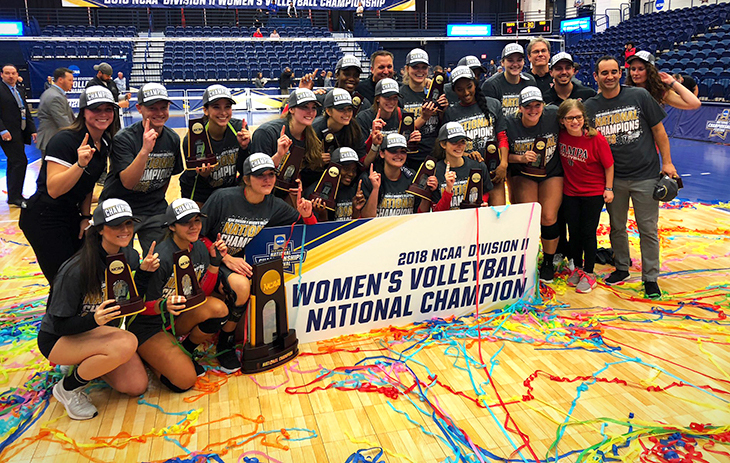 This is the third volleyball title in program history, the first since 2014 and the 16th overall NCAA championship for Tampa. On Dec. 1 in the A.J. Palumbo Center in Pittsburgh, PA, the No. 1 seeded Spartans defeated the No. 3 seed, Western Washington University Vikings, in a five-set thriller to win the title. The win was proceeded by the announcement Nov. 28 that the American Volleyball Coaches Association (AVCA) named Chris Catanach, head women's volleyball coach, as the 2018 USMC/AVCA Division II National Coach of the Year. The Spartans defeated the Vikings in their seventh national championship appearance by set scores of 21-25, 25-18, 21-25, 25-23 and 15-11. Sammy Mueller, the national tournament Most Outstanding Player, dissed out 46 assists in addition to logging 11 digs and two service aces for the Spartans. Helping Mueller receive this accolade were other all-tournament selections, Taylor Fosler, Alexandra Misca and Katie McKiel. Four Spartans had 10 or more kills in the match for Tampa. These players included Sorrel Houghton (17), Misca (13), McKiel (13) and Nylah Demps (10). Fosler ended the match with nine and freshman Sarah Luoma recorded three. The most efficient hitter on the night was Luoma hitting .750, followed by Misca who hit an outstanding .524 on 21 total attempts. Houghton ended the championship game with a .244 hitting percentage, Demps a .185, Fosler a .143, and McKiel a .119. Libero Nicole Dominguez played lights out for the Spartans, recording a team-high of 21 digs and two service aces. Freshman Claudia Rivera followed Dominguez in digs with 19, and sophomore Melissa Elias stated 15. Alexandra Misca led the defensive efforts at the net, earning a team-high and season-high of 11 blocks, followed by Houghton with eight. The Spartans ended the match with 65 kills, 63 assists and 87 digs. The team's hitting percentage was .214, and they had a side out efficiency of 60.8 percent. The Spartans also recorded both three more aces (five total) and three more blocks (16 total) than the Vikings. UT is a member of the Sunshine State Conference, which continues to lead the nation in the NCAA Division II Academic Success Rate (ASR). In mid-November, the NCAA released the ASR for all 24 DII conferences, with the SSC on top for a third consecutive year. The ASR rate of 86 percent shows the hard work ethic of SSC student-athletes. Due to their outstanding performances during the national tournament, four Spartans received all-tournament honors. Sammy Mueller was awarded the Most Outstanding Player, while Katie McKiel, Alexandra Misca and Taylor Fosler were named to the all-tournament team. Two Spartans recorded double-doubles in the match. Sammy Mueller picked up her 18th of the season with 46 assists and 11 digs. Alexandra Misca picked up her first and final as a Spartan with 13 kills and 11 blocks. Misca also logged a season-high in kills with 13. This is Tampa's third national title in program history. The Spartans also won in 2006 and 2014. For more on UT Athletics, visit www.tampaspartans.com.